We are always looking out for sponsors to help with the running and operational costs of running a warbird such as the T6 Harvard. Would you like your company logo on the side of the aircraft? Sponsors would have access to personal flying displays and use of the aircraft for static displays. A social media following of over 20,000 followers – Corporate days to include flying lessons in the T6 Harvard. The list of opportunities and advertising with our aircraft is limitless – How would you like us to advertise your business? Let us work with you! 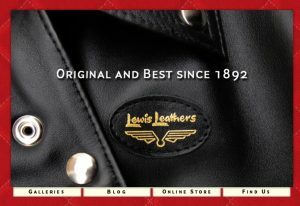 Lewis Leathers – You may wish to be one of the sponsors such as “Lewis Leathers” This company has been around since 1892 and supplied pilots from the 1920s and onwards with bespoke, quality flying clothing. They supplied pilots with goggles, flying helmets, Prestige flying suits and flying boots before and during the Battle of Britain and now they have supplied us with period high quality flying clothing for reenactment. For more information contact us. T6 Harvard Aviation Ltd – We have many social media sites set up so that the public can enjoy our activities and be part of the T6 family. We have many volunteers and admins that are always ready to help and offer advice. Please joint the T6 Harvard movement and share in our journey. The Wacky Wabbit AJ841 official fan club – You can reach us via the Facebook group on the group or via messenger. The group currently has over 1000 Wabbit fans with very helpful admins and volunteers. We are always very active on this page with current Wabbit activities and future events… Feel free to come and join us and post your favourite Wabbit pictures! T6 Harvard and SNJ “The Pilot Maker” – This group is really dedicated to the T6 Harvard/Texan and SNJ aficionado. We encourage people here to share there T6 stories and post anything relevant to the Harvard/Texan. We have posts from pilots, engineers and enthusiasts. This is a regular place for photographers to show off there amazing photographs of Harvard/Texans world wide. We currently have over 2400 members on this group. 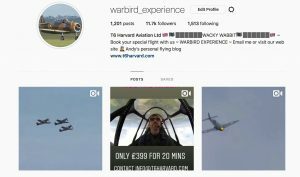 Warbird_Experience Instagram Account – At the time of writing we have over 12,000 members on this account and it is growing at an exponential rate! Every day surprises me as hundreds of new members join. This goes to show that the warbird movement is still very strong and growing with the younger generation. You can reach us though the messenger service on IG anytime. 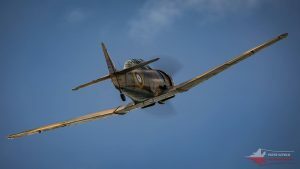 This is an area where we post Wabbit videos and all things relevant to the Wabbit, including airshows, experience flights, harvard conversions plus other warbird related posts. This account is for the warbird aficionado and enthusiast! 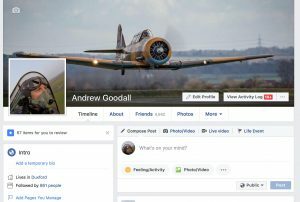 Andrew Goodall Pilot – This is my personal Facebook page and I normally post about my own personal flying here (And some random ramblings about current affairs). I have over 4900 members and this is a public area where I’m open to chat or discussion about anything to do with warbirds or airshow. Every penny helps so if you would like to help us with the running costs of this web site or even the running costs of out Harvard to keep her in the skies over England for the foreseeable future then please consider a small donation to our cause.